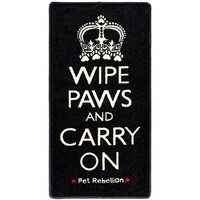 Pet Rebellion Wipe Paws & Carry On Barrier Rug is a trendy way to stop muddy pawprints being trailed through your house. The novelty design lets your visitors know that there is a four legged friend in residence and that they should be careful that they have not brought mud into the house too. The mat will safely grip to the floor and should not move when walked on by pet or owner. You will also find that this mat is extremely absorbent and works very well collecting any debris from muddy paws or shoes. The Wipe Paws & Carry On Barrier Rug is also completely machine washable.